It was a bright sunny morning in Srinagar of May,2004 & people were mellowing out on Sunday. I had gone out for some work early in the morning & came back to home after a couple of hours & no one knew what excitement was in store in Lalbazar area which is situated on the outskirts of Srinagar city. As soon I reached home, somebody was shouting in a jovial mood that a leopard is wandering in our locality but others present on the road laughed off on his remark. The guy made futile attempts to convince the people but in no vain as people were discussing their favorite pastime, Kashmir issue along with Sheikh Abdullah (a deceased leader). After the guy went away, a bearded man came in from another direction oozing with excitement while people on road were perplexed on seeing his excitement. Soon he yelled that a big cat has injured a person living near the four-way (few meters away) & he is currently now in hospital undergoing treatment. Someone from the group said that it is impossible for a cat to injure a person to an extent that will lead to hospitalization. A senior citizen just said, ‘Khudaya Raham’. A sense of fear got instilled in the whole locality as the news spread like a fire. The elderly were all discussing about what would be the future course of action. At that time, mobile telephony wasn’t that much popular so people having Land-lines were ringing non-stop. But still a section was not ready to believe that a snow leopard is in our locality. Soon, a neighbor who was close to the injured confirmed that snow leopard is really present. Terror struck in the minds of everyone. After sometime, a police gypsy carrying cops was seen approaching towards our locality to take stock of the situation. They were now in search of the big cat in the locality. The snow leopard was indeed wandering in the orchards (not present now) behind our home till the four-lane which is a few meters away & it had several residential houses also. After search operations were taken out jointly by people & police, they were successful in sighting the snow leopard which was some 7 feet in length. 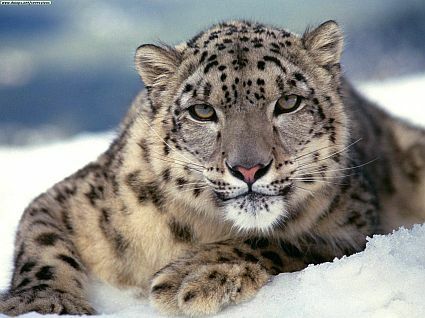 As the snow Leopard saw a huge gush of people, it itself became terrified & was wandering here & there. The area looked like as if a fair was going on with full zeal. People as far as from Ganderbal & Budgam were beginning to pour in. Media was also not behind. A media man was heard saying that they have come from Raj Bhawan (Governor’s house) leaving the press conference there incomplete. I still remember, it was Star TV crew & Sahara TV Crew which came to our home & went upstairs to cover the scene. Likewise other neighborhood houses were also occupied by different news agencies. However, a question erupted that how this animal had reached a residential area? Different theories emerged & the most concrete of them was that the leopard might have climbed a timber laden truck from Dachigam area & it may have jumped from the truck. As time passed by, more & more people assembled to witness the dramatic scene of capturing Snow Leopard. The police didn’t had the manpower to control the ever-growing crowd so it kept itself aloof & didn’t interfere in people’s affairs. The Police were devising strategies so as to how to capture the snow leopard. At first few cops tried their best with Nets so that it may be trapped in it but it proved to be wastage of time. They tried it for an hour but were unsuccessful. The next thing which Police tried was a colossal laughing event. The cops along with some elderly came in contact with a Gujjar having an axe in his hand to catch the snow leopard. The Gujjar accepted the offer with a condition that he be given a Government job in lieu of the heroic job he was going to do. People shouted, clapped & whistled as soon as the Gujjar was ready wearing a motor-cycle helmet on his head looking forward to catch the prey. As soon as the Gujjar went after the leopard, the leopard made contact with the Gujjar with his claws on his forearms & arms. The Gujjar ran away with blood oozing out & was taken to a nearby dispensary for dressing. The leopard shifted his position to another place just to our next door neighborhood with whom we share a common wall. The Forest Department now intervened the scene. They had come with a tranquilizer gun. Now everything was ready for next action. The person who had to shot the tranquilizer came forward to aim the leopard. The leopard also came closer. The man shot the tranquilizer to the leopard but leopard still came closer to the shooter. The leopard just gave a slight touch with his claws to the feet of the tranquilizer shooter & the leopard ran away. The shooter became standstill at his position, became pale & was sweating maximally ,with freight in his eyes & few seconds after he collapsed & after that he was carried away to Hospital. The Drama had entered in an exciting stage. People were roaring. Somewhere in the crowd, people shouted that the tranquilizer is of spurious quality, some said it is expired , some came up with slogan DUPLICATE ! DUPLICATE ! leaving the forest officials ashamed. The big question around police was that how to control the situation which was getting out-of-order. At last they came to conclusion to shoot the snow leopard with bullets. The people surrounding the scene were asked to come down from the walls from which they were witnessing it. The armed cops took the control of the area. The leopard was in target . The firing began with dozens of aimless bullets fired. After several rounds, the snow leopard fell to the bullets & ALAS ! Snow leopard fell on the ground. Target extermination achieved by the police. The excited people cheered on it as if their favorite cricket team had won world cup. It was a carnival minus lightening & crackers. Young boys danced on the occasion. The dead animal had to be taken to Police station which was one kilometer away. The young boys wanted that the dead leopard be carried away by them to the police station. At first the policemen refused but due to pressure they allowed the youths to carry the dead animal. A young boy with green eyes took the leopard on his back just as in Greek mythology, ATLAS holds the Globe on his back followed by a young army of children & teenagers marching towards the Police station. The guys were singing & humming during the carnival. In the midst of excitement,someone chanted loudly, “HUM KYA CHAHTAI !” (WE WANT) & a thundering growl of AZADI (FREEDOM) came afterwards as if it was a martyr. The snow leopard was taken to its promised destination to Police station with a fanfare which is not going to be forgotten for ages. What happened afterwards was that their were allegations of animal right abuses against the cops by animal right groups. The news of the killing of the endangered species of Snow Leopard was carried by national & international media for few days. After that ,they also went silent over the issue & thus Snow leopard saga ended.